We have engineered a comprehensive range of earthing tags which is a way of connection or an earth bond around the cable gland. Made of brass, aluminum and copper these tags ensure earth continuity between the electrical component and the glands. With various sizes and shapes, these are also coated as per the requirements of our clients. We are proficient in manufacturing an exclusive range of earthing tags which are available in various sizes and shapes. 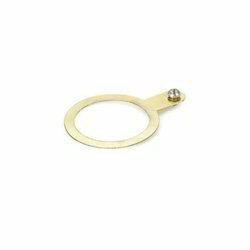 Fabricated from high quality brass, aluminum and copper these tags act as the means of connection or an earth bond around the cable gland. These ensure earth continuity between the electrical equipment and the gland. It can also be coated or plated as per customer specifications. Means of connection or an earth bond around the cable gland. Available in various shapes and in all sizes. Ensures earth continuity between the electrical equipment & to gland. Can be coated or plated as per customer specification. Looking for Earthing Tag ?